The Speaks, consisting of young, talented and charismatic US- based Filipino-Americans from Washington DC, was in the Philippines for almost two weeks. They had mall shows at selected SM Supermalls to promote their album. After the phenomenal success of The Speaks single “High” with a duet from the very talented Barbie Almalbis, the band is gearing up for another round of hits like “Tomorrow” and “Regret” with their album “This is the Time” under MCA Music, Inc. in the Philippines. This album will definitely soon sell like hotcakes.. I was fortunate enough to see one of their Philippine mall show last April 5, 2009, at the SM Mall of Asia. Edward Arevalo and I had meet and greet with the 3 members of The Speaks: Rafael Toledo, Cal Stamp and Derek Lee. Their mall shows were hosted by Boys Night Out. 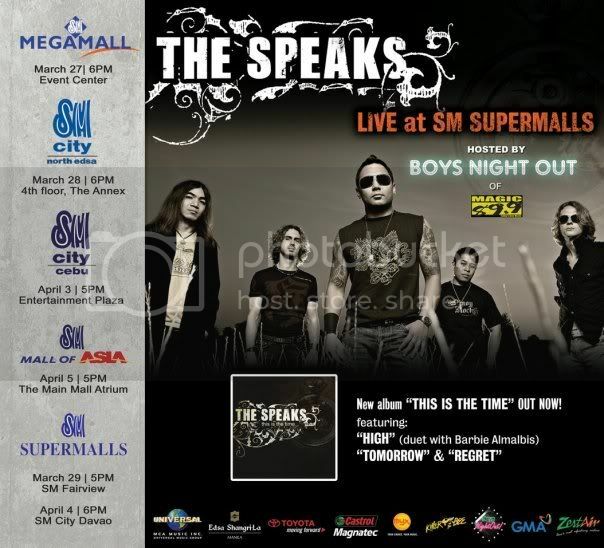 This time, The Speaks‘ music ranges from pure adrenalin-driven rock to soulful ballads. Apologize, Tomorrow (with Julianne), Ang Himig Natin, Kaleidoscope World, and High were some of the songs they sang. I really was blown away by their performance. The group elevates Filipino pride to a whole new level. This event was made possible by SM Supermalls, Magic 89.9, MYX, Toyota, Castrol, The Philippine Star, GMA 7, Edsa Shangri-la Hotel, and Universal MCA Music Inc.
Make sure to grab a copy of their album “This is the Time” under Universal MCA Music — it’s something you definitely won’t regret! Special thanks to Universal MCA Music especially to Grace Foronda… Also thanks to Ed Arevalo for the invites.